Buy Sod in Poway and install Sod in Poway. Learn how to install sod in Poway and Scripps Ranch from San Diego Sod Farm. Order sod 760-789-8010. Measure area for Sod: Multiply the length times the width. This gives you your total square footage to order. Suggestion: Add 5% to the total for irregular shapes. Clear the site of all rocks and debris larger than 2-3 inches in diameter. Rough grade the entire area to eliminate drainage problems. Add topsoil, if necessary, to achieve a total topsoil depth of 4-6 inches. Test the soil pH for balanced and healthy soil before installing sod. Apply starter fertilizer that is high in phosphate. Typical starter fertilizer recommendations are (N-P-K) of 10-10-10 or 19-19-19. Lightly tamp or roll the topsoil to settle the surface and create an ideal surface for installing the sod. Order necessary amount of sod and schedule delivery on the day you plan to start installing sod: Install day of delivery! Same-day installation of your sod is imperative to the success of establishment. Sod is a living plant that requires immediate water, nutrients, and air to live and establish itself. Start at a straight line such as a driveway or walk. Lay out the sod as you would a rug or tiles. Make sure all joints are butted tightly together – without overlapping or spaces between strips of sod. Stagger the joints in each row like rows of bricks. Use a large sharp knife for shaping sod around trees, at flower beds or along borders. Completely soak the sod with at least 1″ of water. Start watering 20 minutes after the first strip is laid. Roll the sod to smooth out small bumps and air pockets. This will assure good contact with the soil. To gauge watering, simply place an empty can about 6″away from sprinkler. When there is an inch of water in the can, it is time to move the sprinkler to the next area. Reflected heat along buildings dries sod quickly; be sure to water such areas more often. Poway has hot days and mild nights in the summer and warm days and cool to cold nights for fall and spring seasons. Poway weather is influenced by the coastal marine layer and occasional fog, producing good gardening and plant growth in the Poway area. 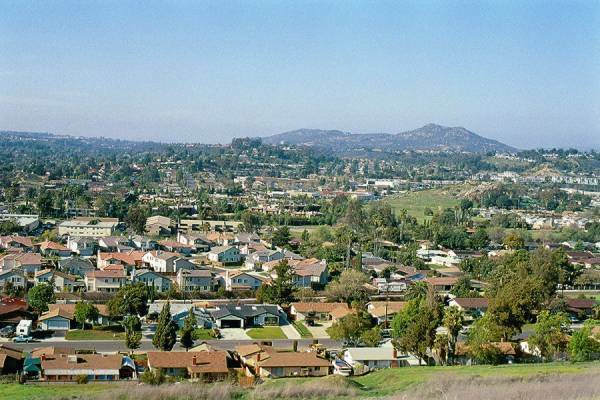 Poway is a broad valley that is partially walled by hills and and large mountains such as Mt. Woodson to the east. Poway lies geographically in the middle of San Diego County, most consider its relative location as north county inland.Though many residents today mistake Poway for an old Western-style cowboy town, its original roots lie in agriculture. Poway has an average elevation of 515 feet and annual average rainfall of 13.5 inches. 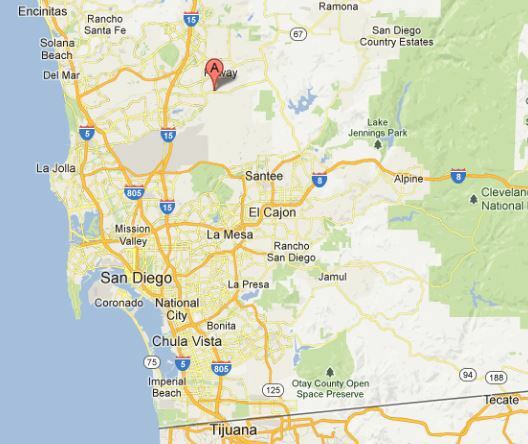 Poway is approximately 15 miles Northeast of downtown San Diego. San Diego Sod Farm Office is located in Ramona with the sod being fresh cut and delivered straight from the farm in the San Pasqual Valley. Buy Poway sod and place your sod order now with San Diego Sod Farm (760) 789-8010.